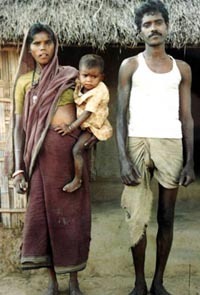 Orang is an immigrant tribe, migrated to this territory from Bihar, Madhya Pradesh and West Bengal. This tribe in Tripura mainly resides in Sadar North and in major Tea garden areas. Orange is plain tribe. They mainly depend on Agriculture, Plantation works of Tea garden and as labourers of Brickfields. As per 2011 Census Orang are only 12,011 persons in the State. Orangs live in clustered village wherein there may be 30 to 50 families. They built their houses with mud wall, chan grasses and bamboos. They do not keep any window in their dwelling house and always keep their houses neat and clean. Orangs speak in broken Hindi, which may be grouped under Australiod group of language. But in Tripura they do not speak in their language better feel smooth to speak in Hindi mixed Bengali, which have originated from Dravidian family. Orang girls are fond to beautify themselves with silver ornaments and saries. They use flowers for hair dressing. Orang sardar of a village act as the chief of the village and look after the well being of their community people. Village priest also act as religious head and take part for settlement of marriage and marriage function. During the marriage, community feast is given by both the bride groom and bride parties wherein huge quality of liquor is consumed beside late night songs, music and dances irrespective age bar or men and women. Orang's "Jhumur Dance" is very much popular among all. Orang cremates their dead after observing series of rites and rituals. Economically Orang is fully depends on wage earning by dint of physical labour. Among them literacy rate is growing and economic consciousness is also in progress. As such in every spare of life Orang tribe residing Tripura is taking part in the development activities of the State.